So here we are, at the very end of the book. There was obviously not much left to decide, but Dorie herself will be our host for this week - quel honneur! She was also the person who made me start baking. I met her at a discussion at the American Library in Paris. To be honest, I was there because of David Lebovitz, in the first place. I was exhausting his blog (and his book on Paris that came out just when I was working in Paris for some month) and already a huge fan of his tips&hints, but also his recipes. I never really did bake or prepare sweets before but with David I started icecream-making (today, one of the few things I dare to say I master really well, even though I still have no ice-making machine). But when I heard Dorie at this event I was amazed by her and had to ask her for an autograph later on. And I asked her about this strange group I somewhere did read about, maybe on David's blog. She encouraged me to try baking and join the group as a good start. How could I not? She was so kind and endearing - everybody would have immediately bought the book and started baking right away! 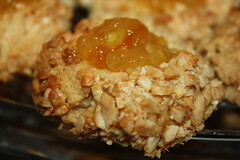 I tried my best to get this recipe right, as it is "Dorie's" recipe. Unfortunately, my dough was either too crumbly or too sticky, can't decide. 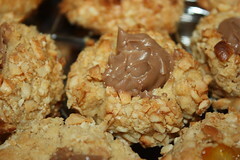 It was to sticky to form balls, and too crumbly to keep the balls together. However, I liked the procedure because it was very much like schnitzel-making. Germans make them a bit different, but we Viennese people take the cutlet, put it in eggwhites, and afterwards in a deep dish filled with very fine crumbs. Very similar, isn't it? It was fun doing, and the results were excellent in taste - but as so often with me, not looking the way they should. The molds didn't keep their shape, so I had barely no cookies with molds big enough to fill. So, what I can give you are some cookies with a bit of orange marmelade and some with a bit of macadamia-cream and a lot of plain cookies. "Plain" is a slight understatement, because these fabulous cookies are made with peanutbutter - one of my all-time favourite ingredients. Therefore, I was not dissappointed at all, although I wish I had managed to get just this last one recipe as perfect as Dorie would deserve it. This, for sure, is the place to send out big thanks to all the people who initiated TWD, kept it alive and managed everything - a lot of work, done while having jobs, having children, having families. It is also the place to send out a lot of greetings and regards to all fellow bakers, who made such great treats week after week. And it is the place to send thanks to Dorie who gave us this amazing book, the first one with recipse I can handle! 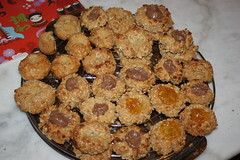 You can find the recipe for the "Kids' Thumbprints" on p. 163, or, I guess, on Dorie's page. Hope to see you all for the new book! Thank you for all your kind comments. TWD bakers are the best, I've met so many dear friends. thank you, thank you. Thank you for baking with me! I have enjoyed your blog and getting to know you:) I will miss our baking group! Love that you have a variety of cookies, and they look wonderful...it doesn't look like you had a bit of trouble with them. My favorite part was the crunchy nuts on the outside, those were just such a good deal! Looking forward to the new book in February! I had to "re-dent" my cookies when they were warm and just out of the oven. Yours look delicious! I've enjoyed reading your blog every week and hearing about baking on the other side of the world. 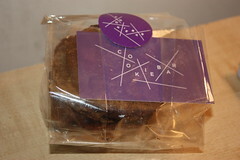 You are so lucky to have met Dorie and to have tried her Cookie Bar cookies! These cookies look great, and macadamia cream sounds delicious! I am so envious that you've met Dorie!!!! I am glad you stopped by for a visit one day. I have enjoyed reading your baking adventures. How fun to have met Dorie Twice. These look great - good on you for perservering with this recipe. It's been great baking with you. Ciao Alvarosa 1 I envy you who met Dorie twice ! !Lovely cookies ! Wonderful cookies. It has been great baking along with you in TWD. Hope you have a happy new year and that we meet up in blogland in 2012! I can't believe youve met Dorie twice, wow! Thanks for the wonderful posts, it's been so great to meet you! How wonderful to have met Dorie! Your cookies look beautiful! I had some problems with crumbly dough at the end of the batch, but most were ok. I think, though, I made the wrong thumbprints! At any rate, they were delicious and TWD has been a good experience for me. Looking forward to Baking with Julia. Happy New Year! The cookies look fantastic! I loved reading your story about getting involved in the group and meeting Dorie. It's been so fun having baking/blogging friends all over the world. I'm looking forward to Baking with Julia, too. I can just picture you running along to the Cookie Bar with luggage in tow! I would have happily done the same thing! Happy Baking in 2012!